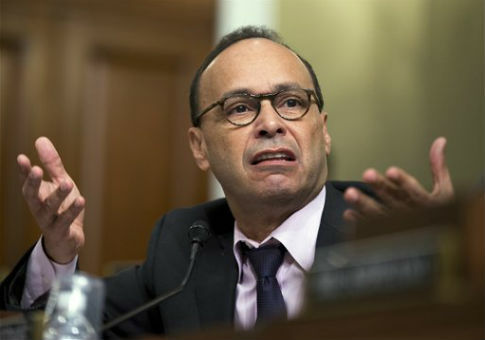 Rep. Luis Gutierrez (D., Ill.) has paid his wife and daughters hundreds of thousands of dollars from his campaign’s coffer since 2010, according to campaign finance data. Gutierrez, who was first elected to Congress in 1993, brought his wife, Soraida Gutierrez, onto his campaign’s payroll six years ago to act as his office manager, treasurer, and fundraiser. Soraida Gutierrez was a registered lobbyist in the state of Illinois from 2003 to 2009 before joining Gutierrez for Congress. She has since raked in more than $300,000 for her work on behalf of the committee while being the top recipient of campaign cash in three cycles since stepping into her role. The first time Soraida acted in an official capacity for the campaign, in 2010, she pulled in over $44,000 and was the top recipient of cash from the Gutierrez campaign that year. Soraida then pocketed over $93,000 in 2012, making her the biggest beneficiary of campaign funds for the second election cycle in a row. The committee disbursed $383,848 in 2012, so Soraida’s payments constituted roughly 25 percent of all campaign expenditures. Soraida was yet again the top beneficiary of cash from Gutierrez for Congress during the 2014 election cycle, receiving $110,000. Herman Andrew, a vendor, was the second highest-paid individual at $24,000. Soraida has pocketed $65,000 during the 2016 election cycle to date. She has been paid a total of $312,000 from the Gutierrez for Congress campaign committee since 2010. Gutierrez’s wife is not the only member of his family to benefit from his campaign. His two daughters have also received thousands in payments over the years. Between 2004 and 2009, Gutierrez paid his daughter Omaira Gutierrez $4,270 for bookkeeping services. Another daughter, Jessica Gutierrez, received $600 in 2004 for her help with a fundraising project. Members of Congress have been allowed to place family on their campaign payrolls since 2001, when the Federal Election Commission issued an opinion at the request of former Rep. Jesse Jackson Jr. (D.,Ill). Jackson went on to pay his wife’s firm hundreds of thousands of dollars from his own campaign committee. He and his wife pleaded guilty in 2013 to using $750,000 in campaign funds for personal use. While the practice of paying family members is legal, some say it veers into questionable territory. "Is there anything patently wrong with having a family member work on a campaign? Arguably not," Dave Levinthal of the Center for Responsive Politics told the Chicago Tribune. "But it gets into sticky territory when the candidate, him or herself, stands to benefit personally in a significant way from political donations that are being made to fuel political efforts." Gutierrez’s office did not return a request for comment on the payments made to his wife. This entry was posted in Politics and tagged Illinois. Bookmark the permalink.